Incredibly well thought out concept.In her own way the author has shone the light on an issue, which I personally believe doesn't get the attention it deserves.The mental health medical care situation in N.Ireland is lacking and antiquated, much like their views on abortion. The time of The Troubles, as they are called, have left a huge impact on their society. Globally everyone will be aware of the actual events, but how many of us realise that the trauma of those events have left their imprint on younger generations. The children and family members of those targetted by violence. The country has seen a high rise in mental health issues related to post traumatic reactions.I do not under any circumstance want to appear as if I have forgotten the flip side of the coin, ergo any non NI persons who were involved and whose families are just as traumatised by the violence. 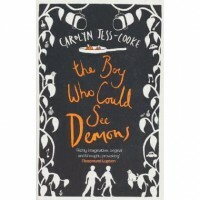 This book features in NI so I will stick to that.The main character is a young boy, who is either suffering from schizophrenia or just happens to be able to see demons. That question or rather the answer to it is handled like an excursion on a tightrope. The belief in the demon or devil draws you in only to be dispersed by common sense and medical knowledge. The psychiatrist treating him has personal demons of her own and saving the young boy has her crossing the boundaries both personally and professionally.That story on its own was intriguing and I found myself taking an interest in his well-being.Then the plot takes a gigantic swivel and literally implodes.I thoroughly enjoyed it.It was clever, sad, disturbing and emotional all at the same time.It also wasn't anything like I expected it to be.I received a copy of this book via NetGalley.